This competition is open to all Ohio 4-H members enrolled in any 4-H Shooting Sports discipline and age 13 as of 1/1/2019. 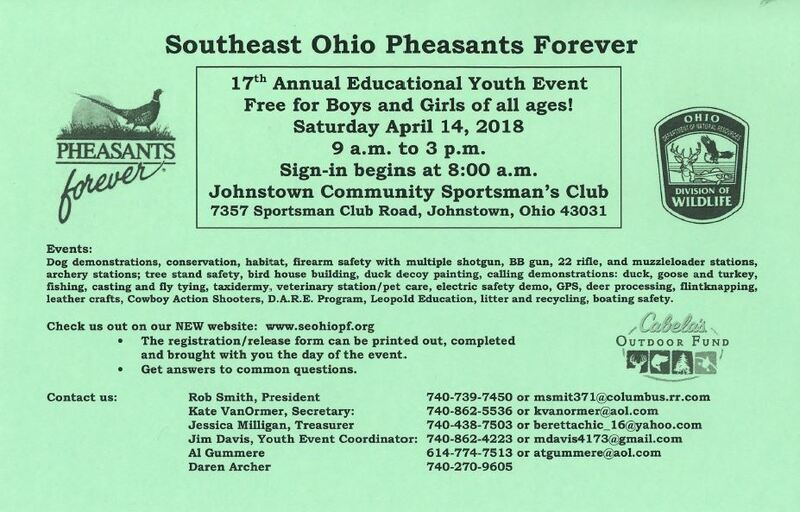 Youth must meet all Ohio 4-H Shooting Sports requirements, including but not limited to, being knowledgeable and proficient in the safe use of the equipment and knowledgeable of the general rules of the event. The event is April 13, 2019 at the Cardinal Shooting Center in Marengo, Ohio and only includes a shotgun competition this year (additional disciplines will be added annually). The cost to register is $40 by April 5th and $50 late registration/day of event. All targets are provided but members will be responsible to supply their own firearm and ammunition. To register on-line: https://go.osu.edu/ss2019 All appropriate forms will be emailed to each youth registered. Those registering day of the event must be accompanied by a parent or legal guardian to complete the appropriate forms. The competition serves as part of the selection process for the 2020 Ohio 4-H Shotgun Team that will compete at the National 4-H Shooting Sports Competition held in Grand Island, Nebraska. Youth ages 13-17 as of 1/1/19 are eligible for the team. Those youth age eighteen as of 1/1/2019 can compete for awards but not for selection to the 2020 State Team. The application is now available for those who wish to apply to be a Licking County 4-H Shooting Sports Ambassador. Applications are due by May 4, 2019 to the address listed on the application. Interviews will be held at the Licking County Extension Office on Friday, May 10, 2019. More information and the application can be found here. Cost: The total cost of the trip is $225. The Licking County 4-H Shooting Sports Committee, in cooperation with the Licking County 4-H Committee, will cover 50% of registration costs for two delegates. The delegate will be responsible for $112.50. Who can compete: Any youth 9-12 as of January 1 of the current year for Junior Ambassador and any boy or girl 13-18 as of January 1 of the current year. Requirements: Must live in Licking County, must be in a Licking County 4-H club with a shooting sports project, and have a good knowledge of all major shooting sports disciplines.